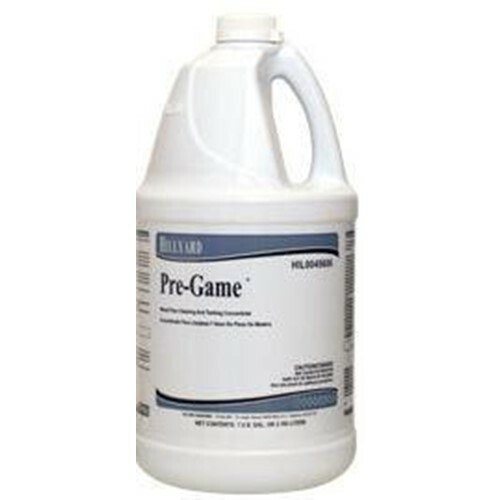 Hillyard Pre Game is a special water based formulation designed for scrubbing a wood floor in preparation for coating and tacking between coats of wood seals and finishes. Pre Game helps remove dust, dirt and other contaminants in preparation for coating. Tacking with Pre Game helps ensure a clean surface for coatings to bond with. Pre Game leaves no greasy or oily residue to destroy gloss. It can be used for preparation and tacking for both solvent and water based seals and finishes. Pre Game can be used for preparing wood floors with both autoscrubbers and standard floor machines. Pre Game dries in only 30 minutes under normal conditions when tacking so you can apply seals or finishes almost immediately. Finally, Pre Game can also be used as a daily maintenance cleaner to help keep your floor safe and clean. Pre Game emits no irritating fumes that can make the preparation and tacking of your wood floor unpleasant. Pre Game rinses very freely and leaves no residue.